Dr. Iñigo San Millán uses his insights from working with Tour de France teams and Grand Tour podium riders to remind us that as athletes, carbohydrates and glycogen are still our “gold”. Nutrition is a key part of the training regime of any athlete. Not ingesting enough calories (Kcalories-Kcal) can result in a lack of important macro and micro nutrients. This is especially true when it comes to carbohydrates (CHO). Modern societies tend to “demonize” carbohydrates and there are multiple nutritional “gurus,” books and diets out there claiming that high-protein and or high-fat diets with important restriction of carbs are the way to go to lose weight, have a healthy diet and even improve performance for competitive athletes. However, from what I have seen these books and diets lack substantial scientific evidence – especially when it comes to athletic performance. This is especially true for athletes who restrict their carbohydrates intake, as the massive amount of scientific evidence for the past 50 years clearly shows that a good carbohydrate diet is crucial to maintain performance. Not only is science telling us this, but also the real-life experiences of athletes performing at the highest level. We can find a great example of this in Kenyan runners who are by far the best endurance runners ever in history, dominating all top events internationally for decades. The percentage of carbohydrates in their diet is 76.5%….and even 20% of their total daily caloric intake comes from sugar!1 Therefore, it seems clear that a good carbohydrate diet is of great importance. The rate of ATP synthesis is parallel to the exercise intensity which determines the substrate demands of skeletal muscle to generate ATP. During exercise, skeletal muscles use primarily Fat and CHO for energy purposes, and at low exercise intensities fat is the preferred substrate although there is always some glucose utilization. At higher exercise intensities of about 50- 60% of VO2max, ATP synthesis demand increases, and fat cannot entirely meet the rate of ATP synthesis, so glucose oxidation increases. Furthermore, at higher exercise intensities fat cannot synthesize ATP fast enough for the contractile demands of skeletal muscle fibers. Although the utilization of fat yields a much higher amount of ATP, glucose utilization is much faster, therefore necessary for ATP synthesis. This is why carbohydrates are of great importance during exercise done at high intensities during competition. Fat simply cannot provide the energy needed for ATP synthesis. In our laboratory we observe the fat and carbohydrate oxidation rates (“burning”) at different exercise intensities and over time. At a typical cycling or running “race pace”, carbohydrate utilization is in the range of 2-3g/minute. Thus it is crucial to have a good glycogen stores as well as to have the proper carbohydrate intake during exercises lasting more than 2 hours. Even at low exercise intensities carbohydrates are always used, so there is a false thought and even claim by some that during low exercise intensities fat is the sole fuel that is used. At low exercise intensities most individuals are “burning” carbohydrates at 1-2 g/minute. Therefore, for exercise lasting longer than 1:45-2 hours, proper carbohydrate and glycogen content are crucial. This is true during the competition and high intensity training, as well as during low-intensity training. Glycogen is the storage form of glucose and carbohydrates (CHO) in animals and humans. Carbohydrates are a very limited source of energy accounting for only about 1-2% of total bodily energy stores.3 Furthermore, about 80% of total carbohydrate is stored in skeletal muscle, about 14% is stored in the liver and about 6% in the blood in the form of glucose.4 This would represent about 300-400g of glycogen stored in muscle and about 70-100g stored in the liver. As we can see, while glycogen is “gold” to athletes, we have a very limited and low capacity to store it. At rest, skeletal muscle accounts for 15-20% of peripheral glucose utilization, while during at an exercise intensity of 55-60% VO2 max, glucose utilization by skeletal muscle could account for as much as 80-85% of whole-body disposal5 and could account for even more at higher exercise intensities.6 So muscle glycogen is crucial for ATP resynthesis during exercise. Since our glycogen storage capacity is so limited, many high performance athletes may find it difficult to even keep up with sufficient CHO intake and therefore have some patterns of glycogen depletion.2, 19-20 When glycogen levels are low or there is a glycogen depletion, muscles increase the utilization of protein and amino acids to produce glucose, acting as gluconeogenic precursors.21-22 Since protein and amino acids are the building blocks of muscle, the latter may enter a catabolic situation (muscle breakdown). Essentially, the muscle “eats itself to feed itself” by increasing the amount of protein and amino acids used for energy purposes. This situation may lead to muscle damage. It may further lead to chronic overtraining, as it has been shown that muscle damage limits and interferes with glycogen storage and synthesis,23- 24 so that even with a high carbohydrate diet it would be difficult to maintain glycogen storages. If this happens, the athlete could enter a vicious cycle leading to overtraining and a decrease in performance. From my experience working with all kinds of athletes, I see that a “catabolic” situation elicited by low glycogen storages is probably the number one cause of overtraining in athletes. How Many Carbohydrates Does an Athlete Need? Carbohydrate intake should be based on the rates of glycogen depletion and the physical activity an athlete is engaged in. Low intensities involve lower CHO needs. However, low intensity workouts during long periods of time will for sure require a higher daily intake of carbs. High intensity workouts rely on glucose almost exclusively – there is always a high degree of glycogen depletion and therefore these kinds of workouts require a higher carbohydrate intake. The guidelines for carbohydrate consumption during competition call for 30-60 g/hour. However it is possible that these recommendations fall short when it comes to endurance and ultra-endurance events. With data from our laboratory we believe that the right target for carbohydrates should be in the range of 80-100 g/hour for events lasting more than 4 hours. We tried these new recommendations in 2010 with the Garmin Pro cycling team and it worked really well. This method was proven during the Tour de France, with no GI disturbances from the athletes. We have since tried these recommendations with many athletes of different sports and competition levels with great success and performance results. For such a high carbohydrate load it is essential to mix carbohydrates of different glycemic index and rates of absorptions. A mixture of simple and complex carbohydrates is the most efficient way to go. Dr. Asker Jeukendrup, one of the top experts in the world of sports nutrition, has also observed similar findings. 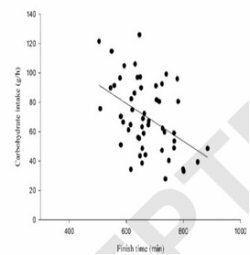 The graph to the left shows how Dr. Jeukendreup and his group observed that higher carbohydrate intake was associated with faster finish time at triathlon world championships in Kona. Regarding the daily intake of CHO it will vary depending of the level of activity and the duration. An excessive carbohydrate diet without the right amount of exercise would lead to increase in body fat due to conversion of CHO to fat. Therefore a recreational athlete who trains 1 hour/day should by no means eat as many carbohydrates per day as a professional cyclist or high-performance triathlete. For some guidance we recommend the following chart regarding daily carbohydrate needs. Dr. Iñigo San Millán, Ph.D., is the Director of the Exercise Physiology and Human Performance Lab at the University of Colorado School of Medicine and also Assistant Professor of Family Medicine and Sports Medicine Departments at the University of Colorado School of Medicine.'Dr. San Millán is considered one of the most experienced applied physiologists in the world. He has worked with many elite athletes and teams in sports including track and field, running, triathlon, rowing, basketball and cycling; including eight professional cycling teams. 'Follow'Iñigo on Twitter.